Sometimes, fast paced mini-games need a theme to string them together. In Plünge, that theme is plumbing. Playing head to head against another player in order to make a plummer fall in-love with you, Plünge was designed to be played using two toilet plunger controllers. 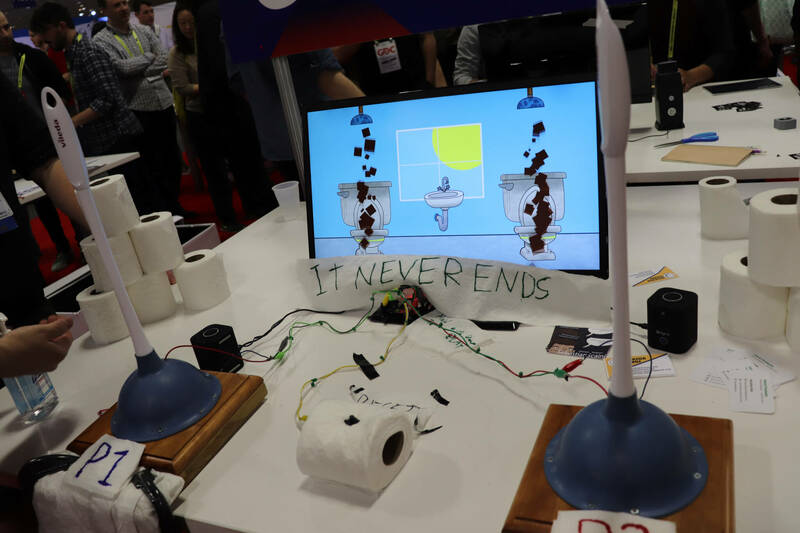 At GDC, I was able to try out these controllers for myself. These mini-games are quick and each one takes a few plays to completely figure out. One has you plunging at the correct time as a bulge in a pipe gets to your end, while another turns you into a wizard who needs to plunge as fast as possible to beat the other player. Another, almost-three-second long game, sees you just using your plunger the fastest, to hit your opponent in the face. My favorite challenge was a rhythm based game where you need to plunge at the right time to hit a bunch of bulges coming towards you, until your opponent messes up. Not everything is in the same hand drawn style. In a pixel-art level, you can pogo stick with your plunger over crocodiles in the sewer. Plünge is certainly an interesting game, especially with the plunger controllers. If you’d like to take a look and play the game on your keyboard, you can find it for free on itch.io.